Everyday 200 tourists and 300 porters start their journey at kilometer 82 on the classic Inca Trail trek to Machu Picchu. Due to the extreme popularity of the trek, Peru has invested a large effort into protecting and maintaining this famous trail by limiting numbers, issuing licenses and building specialized camping areas. If you are about to head out on your own Inca Trail trek, then besides trekking at the right time of year, here is a quick list of things to expect so you can be as well prepared as possible. When they tell you that day 2 is the hardest day…they are not lying. This march to dead women’s pass is a lot more uphill than I expected. The vast amount of stairs going up is at varying heights making this day challenging, not so much of a simple walk in the park. All weather conditions possible. We went from short sleeve shirts in the sun to pouring rain with less than comfortable temperatures. The summit of dead women’s pass at the end of day 2 was freezing cold and really windy and with long sleeve shirts, jackets, mittens, hats, and everything else, it was still cold. On the third day it poured rain hard enough that if you weren’t enveloped in gortex or under a poncho, you were probably wet. The conditions on the trail vary as dramatically as the seasons throughout the year. Squat toilettes, or no toilettes at all. The toilets on the Inca trail consist of a hole in the ground with two treads to put your feet on and they are not pleasant. Five hundred people with muddy feet all trying to use the only six toilets available makes for questionable hygienic status. These toilets are few and far between throughout the day so most people use nature’s toilet. Hint! Practice your squat before you leave. Breathtaking scenery. From the minute you start the walk to the day you arrive at Machu Picchu this trek is littered with the amazing scenery of the Andes. The Andes provide some seriously amazing views, and the Salkantay trek to Machu Picchu can provide an alternative example of high altitude vistas. From giant, green mountains with the occasional waterfall in the background to the jungle like cloud forest this trail’s landscape is never disappointing. More ruins than you expect along the way. It is not just Machu Picchu you will be seeing along this four day journey. From old fortresses to ceremonial locations, this trek is bursting with alternative ruins along the way. Expect to see ancient ruins resting all around you often times with no road access; these ruins are for walkers alone. As you move through the trail you will have the opportunity to stop and explore the different archeology of the Inca people. No Showers. I don’t care what the tour company tells you…there are no warm showers, or even showers at all. Years ago Peru tried to put showers and even a restaurant at the last camp site but it was shut down due to vandalism so don’t get your hopes up. You are just going to have to look like you have survived four days of the wild trails of Machu Picchu. Early Mornings. When the sun gets up, you get up. Starting your day as early as possible means that you can take more time on the trail, whether that be spent struggling up the ancient stairs or enjoying some archeology close up. Porters make you feel luxurious on your dirty trek. These guys are beyond amazing. They take half of your cloths, your tent, your kitchen, your chairs, everything and run it up the hill on their backs all while wearing sandals, making you and your hiking boots look like a joke. When you arrive at your camp with your tent, sleeping bag and everything laid out for you, these guys make you feel like a celebrity as they clap and cheer you on as you enter the camp. Following this they supply you with warm wash water, tea, popcorn and eventually, dinner. I even saw one run to camp and come back with a sandwich to feed a hungry hiker. These men do their utmost to make you feel like a celebrity during your tricky trek. Camaraderie among trekkers. Your tour group may be full of all new people, but by the end of the trek they are more like your new family. Everyone has likely been building up this moment for the last three months from the time when they received their license to hike the trail. These friends with similar goals will be experiencing the ups and down alongside you enriching your experience. Clapping and hugging you as you finish, carrying your bags, or even holding your hands as you use nature’s toilet. The Inca Trail experience definitely breaks down the barrier of ‘we just met’ and builds family-like relationships; your support system on this journey. Over populated camp sites. There are only a few places to camp on the Inca trail due to protective restrictions set by the government. For three nights all five hundred people including tourists and workers will camp in relatively the same area. This causes what one would could consider to be a bit of a sanitary issue. 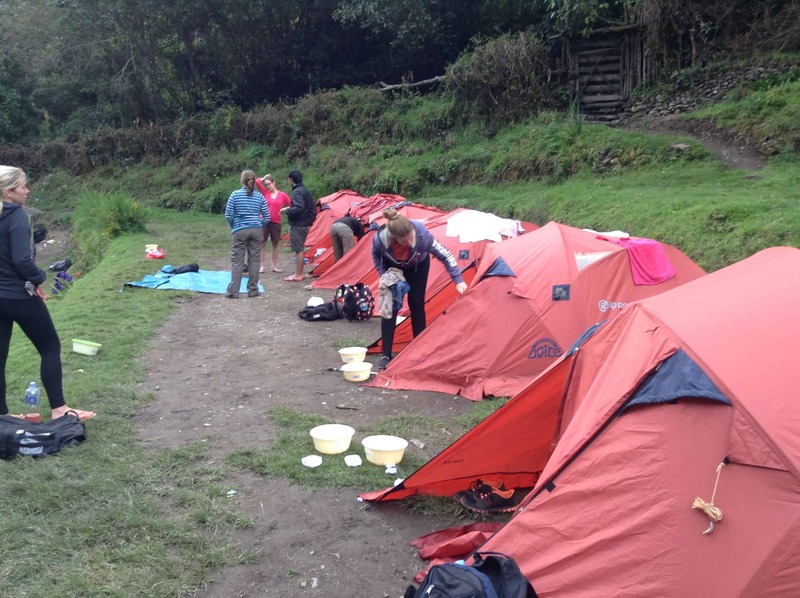 With all the rain and footsteps, the camp sites are covered in mud, bathrooms are limited and who needs running water. Expect to be muddy and busy from the minute you start until you reach the town of Aguas Calientes.